Some members present at the Wadda Gurdwara Sahib Ipoh (WGSI) meeting on 28 Feb 2016. 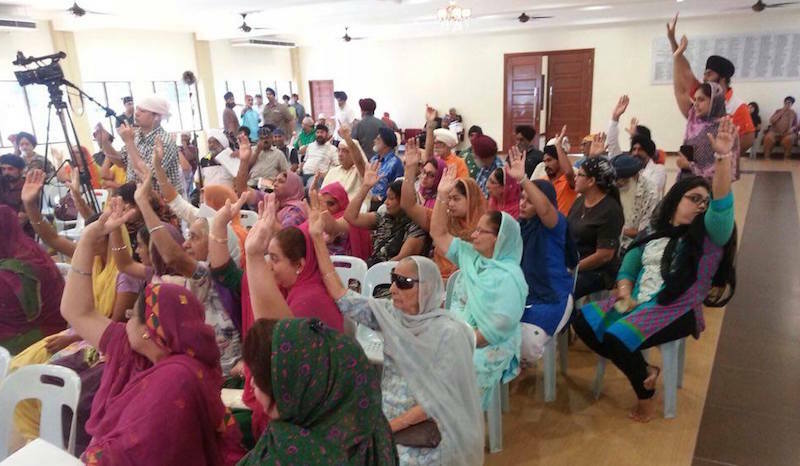 The reveberations from the heated annual general meeting (AGM) of Wadda Gurdwara Sahib Ipoh (WGSI) continue with the latest revelation that foreign maids were brought to vote at meeting and two volunteers facing possible court cases. Days after the meeting, WGSI gurdwara management committee (GMC) deputy president Calvin Randhawa tendered his resignation, citing ‘pressure’ from family and friends with some of the recent events at the gurdwara. At the same time, in a statement released to the Asia Samachar yesterday, Malaysian Gurdwaras Council (MGC) had expressed regrets on the presence of police on the gurdwara compounds during the AGM. “The MGC regrets the presence of Police at the Wadda Gurdwara Sahib Ipoh AGM held on 28th February 2016. This is because the Gurdwara Sahib is held in high esteem by the Sikhs and is a core institution for the Sikh way of life. A Gurdwara is also a centre of enlightenment and a promoter of the code of conduct and of the highest ethical values amongst Sikhs,” said MGC president Jagir Singh in the statement. The WGSI meeting on Sunday had grabbed the attention of local Sikhs when photos of police presence at gurdwara compound began making its rounds via the social media. Key gurdwara committee members made the call for police cover when some members began protesting for being turned away from the AGM due to lapsed membership. In related incidents, two active gurdwara volunteers were later held by the police for investigations connected to the AGM. They have been released after questioning. In the latest turn of events, WGSI committee yesterday made an about turn on its stand to strike off members whose membership had lapsed. In a meeting, it had decided to reinstate lapsed membership upon taking into account the ‘strong sentiments of the Sangat’ on the matter. It had shared the decision on the gurdwara’s Facebook page [see below]. Some maids from Punjab were also said to be present at the Wadda Gurdwara Sahib Ipoh (WGSI) meeting on 28 Feb 2016. 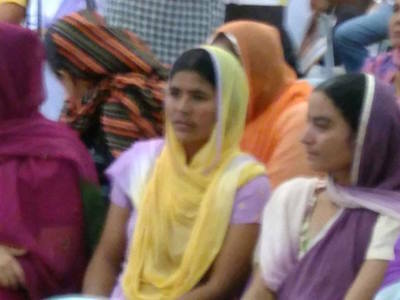 Since the AGM on Sunday (28 Feb 2016), Asia Samachar has received photos showing the presence of maids from Punjab, who are working at homes of prominent local Sikhs in Ipoh, taking part in the meeting. One photo shows two ladies, both wearing Punjabi suits like most of the other ladies present, raising their hands up, supposedly voting for some issue brought to the attention of the floor. “Anyone is welcome to the gurdwara, but non-Malaysians vote in meetings of locally registered societies. That’s my understanding of the rules and regulations with regards to the ROS. And why involve the poor maids Their employees should not have dragged them to the meeting floor?” said one Ipoh-based Sikh lawyer. When asked to comment on the matter, WGSI committee president Amarjit Singh Gill did not deny the presence of foreign maids at the meeting, but stated that the gurdwara constitution allowed for any Sikh to become a member. However, he added that the constitution has since been amended, restricting membership only to those who either are born or are residing in Perak. Since the issue flared up, many comments on the Asia Samachar and other platforms have raised the role of the MGC. Hence, a question was posed the query to the council, which has 108 gurdwaras as its members. In a statement, Jagir said MGC was following closely the events at WGSI and has asked its Perak representatives to find out what actually transpired and to submit a report. “Sanggat must understand that most Gurdwaras are registered with Registrar of Societies, including Wadda Gurdwara Sahib Ipoh, and thus they are bound by the Constitution of the Gurdwara. “Therefore members of Wadda Gurdwara Sahib Ipoh can decide on the running of the Gurdwara, attend AGM, vote at elections, elect committee members, approve ammendments to constitution (if any) etc. “The MGC, thus cannot have a say in how the Gurdwara Sahib is run but can play an advisory role and see whether the Code of Ethics and Conventions of Sikhism have been followed,” he said. The MGC, after receiving the report and carrying out its own investigation, will deliberate on the matter, he added. Moving forward, MGC has been urged to appoint observers to gurdwara AGMs. “MGC can send its representatives to monitor AGMs. In this way, they can help should disputes arise,” said academician Assoc Prof Dr Sarjit Singh Gill, a social anthropologist at Universiti Putra Malaysia (UPM). It may be easy to settle,by paying 100,000 each!Question would arise ..where the money comes from..Gurduara funds? It is sad to hear about the commotion in wada gurdwara recently Being a long time resident of Ipoh who have left Ipoh. Wada gurdwara is close to my heart until I live. It has fond memories in my family’s heart. Gurdwara committee members and jathedar and the sevadars are all doing seva for the community and for themselves too (seva brings self closer to God). Since the suspension of the members have been withdrawn. Why in the first take such drastic action? This is gurdwara and not political party election… Our guru teaches us to be humble and serve with humility.. This reminds the displeasure of sangat with the committee of day then Guru Nanak humbly went to Bhai Lalo’s house. By doing this guruji has left us a message to ponder.